Ready to fly: Members of the club practise on Da Son Mountain. For adrenaline seekers in Da Nang, paragliding clubs offer a new opportunity for airborne adventure, as well as a chance to see their native city from a different perspective. Cong Thanh reports. Having reached Mount Fansipan in 2000, Tran Thi Thu Thuy, continues her adventures with paragliding, a new aerial sport on the Son Tra Mountain in the central city Da Nang. 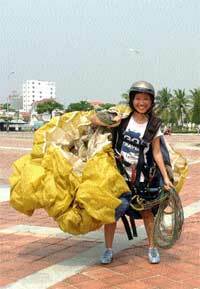 Thuy, 31, one of the four women members of the Da Nang Paragliding Club, has practiced the airborne skill since she participated in the team's training sessions last year. "Practicing with a parachute offers me the hands-on experience to control a parachute and use equipment, such as GPS, radio, and wind meter," she said. 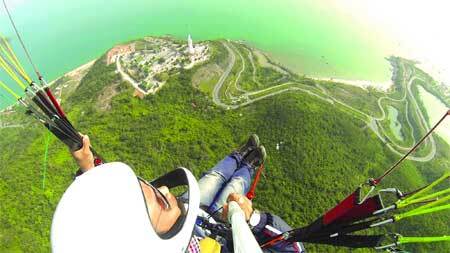 Bird's eye view: Paragliders get the chance to see Da Nang City from above. 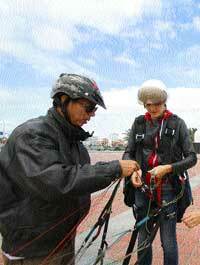 Air training: Foreigners living in Da Nang join a paragliding session. Thang added that he can fly six or seven times during each trip, but it all depends on the wind speed. Winging it: A young member of the Paragliding Club. Paragliding, an airborne adventure sport, debuted in Viet Nam when the country hosted the Southeast Asian Games in 2003. The image of a paraglider taking off from a high point to land in the national My Dinh Stadium with a banner "Thank You" is firmly etched in the minds of fans. 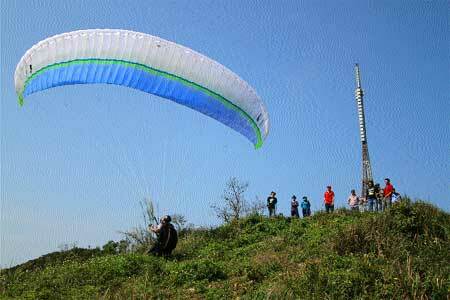 Paragliding is offered in Ha Noi, HCM City and Da Nang. However, Son Tra Mountain, nearly 700m above sea level in Son Tra peninsula in Da Nang, is one of the most popular paragliding locations in Viet Nam. 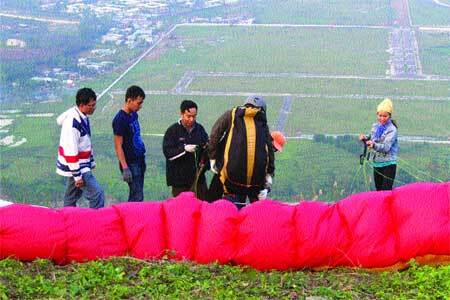 The Da Nang Paragliding Club is the youngest team in the country with 16 members training every weekend. The city has designated the sport as an entertainment for tourists along with water-motor, jet skiing, paramotoring and ballooning. Ho Nguyen Thien Phong, 24, the youngest member of the club, said that he had trained with the Southern Air Club in the HCM City when he was a student of the city's Technique and Industry College.